Thousands of junior doctors in Britain on Wednesday struck work for the third time since last month in relation to a dispute with the government. 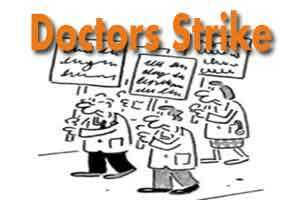 The strike began at 8.00 a.m. and will last 48 hours, although the doctors were providing emergency care in hospitals, EFE news reported. This is the third strike organised by the British Medical Association after the government announced, after failed talks between the two sides, last month that it would impose new contractual terms to junior doctors. Wednesday’s strike caused more than 5,000 operations to be put on hold and many medical procedures were cancelled. A survey, released on Wednesday which polled 860 people, found that 65 percent of respondents support the strike, compared with 17 percent who disagree. It is estimated that there are over 50,000 junior doctors in Britain, including those who have just graduated and those preparing to specialize for periods that can exceed a decade.